February 11, 2019 - 6:30 p.m. ~ February 11, 2019 - 9:30 p.m.
Monday, February 11th - 6:30 p.m. ~ 9:30 p.m. 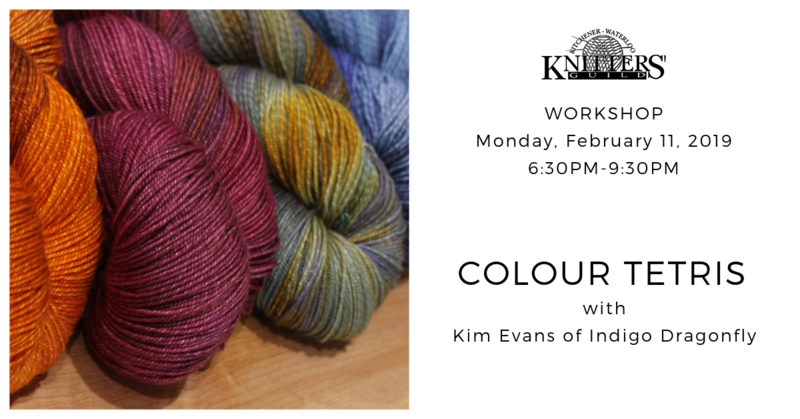 Please contact programming@kwknittersguild.ca to register online via PayPal invoicing (no account required). Registration is first come, first served, and payment is required to reserve your space. There is a maximum of 30 students for this event– so please register early to avoid disappointment! Colour, especially combining colours, often makes us nervous. Come and play in this hands-on workshop, elbows deep in yarn and colour and learn how colours can change how your textiles shine and reflect different personalities. Learn how to create different moods with colour, neutral knitted items that are not just black and grey and how to build colour combinations that are fun or sophisticated, professional or playful. Use colour to flatter YOU and express yourself, without fear. pencil, pen, notebook for taking notes.